Description: CN SD75I #5642 leading NS 40T southbound on R&N passing Penobscot yd. Description: CN SD75I #5642 and CN SD40-3 #5945 lead a Westbound Manifest over the IC bridge. We were surprised to see two trains on the Freeport line, as it is not very busy. 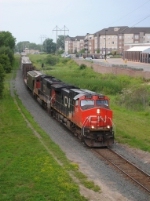 Description: CN 5642 blasts through Durand with a mixed freight. Description: SD75i # 5642 leads an eb freight thru Jasper. Title: CN 5642 Fall colours are just starting. Description: Westbound over Grand Blanc Road. Description: A long manifest passes through Potsdam with a CN unit in the lead. Description: B798 makes her way south towards Massena with a heavy train. 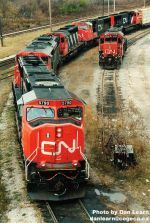 Description: Locomotives which would have made up the North American Railroad (failed merger of CN and BNSF) lead a coke train west on the former EJ&E. Description: Rarely seen on the TRRA: a CN-led train. Two SD75I's pull this manifest toward the Merchants Bridge. Description: The WC slides under Silver Lake Road as the daylight slowly seeps away. Description: CN 438 glides past the wig wags just east of tilbury. Description: With its whole 22 car train in view, CN 438 is just south of Chatham riding on whats left of the CASO, which is soon to be discontinued.